With close to 30,000 kilometres of shoreline outlining the four Atlantic Provinces, the best way to explore this part of Canada (as any Canadian will tell you) is in the seat of a sea kayak. If you're interested in experiencing a variety of sea life like whales, porpoises, seals, eagles, puffins, gannets, and osprey or you're just interested in a chance to kayak the world's highest tides, most rugged coastlines, and most unexplored beaches - let Fresh Tracks help you plan the Atlantic sea kayaking adventure you'll never forget. Some key destinations for unforgettable wildlife watching, natural beauty and an all-encompassing experience of the immaculate North Atlantic include Newfoundland, Nova Scotia, New Brunswick and Prince Edward Island. The Stephenville Port area in Newfoundland is a synonymous with its rugged west coast. The put in for "the Gravels" is along the isthmus leading to the Port au Port Peninsula. There is a large parking area on the right and an easy launch off a broad gravel beach. Once on the water, you can head in a westerly direction toward low cliffs of sloping limestone, which have been carved into intricate hoodoo-like forms in many places. The crystal clear water is intoxicating and the shoreline alternates between secret beaches and rugged headlands. In addition, the limestone bedrock was once a part of a shallow ocean reef and a variety of fossils can be found in many outcrops if you're interested in fossil collecting. If you're looking for a secret gem known for its world-class wildlife and natural splendor, look no further than New Brunswick's Bay of Fundy. The Bay of Fundy rarely gets warmer than 15 degrees C in summer, which is only about 10 degrees warmer than in winter. The currents around the Fundy Isles are among the strongest tidal currents in the world. The Bay of Fundy also boasts the highest tides in the world (up to 50 feet between high and low tides). In addition, Deer Island is home to the largest Whirlpool in the Western Hemisphere, the Old Sow. These massive currents stir up an unusual amount of sea nutrients that feed an unusually abundant amount of sea life. The east coast of New Brunswick, CA, are among the best locations on the east coast of the Atlantic to view whales, seals and porpoises. The summer of 1999 was the first year Orcas have been sighted in the bay since the 50's. An old record exists that boasts that the world's largest Great White Shark was caught off the coast of Grand Manan Island in the 1930's. See a variety of sea life like whales, porpoise, seals, eagles, puffins, gannets, and osprey as you experience the world's highest tides, rugged coastline, and unexplored beaches of Nova Scotia. Once you're paddling the crystal clear open waters, relax and take a deep breath of the wonderfully clean air and listen to the loons or observe the elegant Blue Herons, the busy Ospreys or the Bald Eagles. If you're interested in observing the marine life, Nova Scotia offers an enormous variety of colorful star fish, mussels and lobsters. You may even come face to face with a friendly seal. No matter where you decide to go for your next Atlantic Canada sea kayak adventure, Fresh Tracks will help you discover the sea kayak adventure of your dreams. 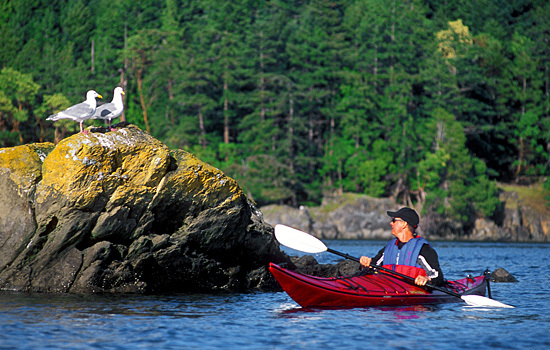 Need more information on Sea Kayaking the Atlantic Coast of Canada? Talk to one of our Canadian travel Insiders who'd be happy to answer all your questions.